Looking for satisfying nibbles for The Big Game Day? 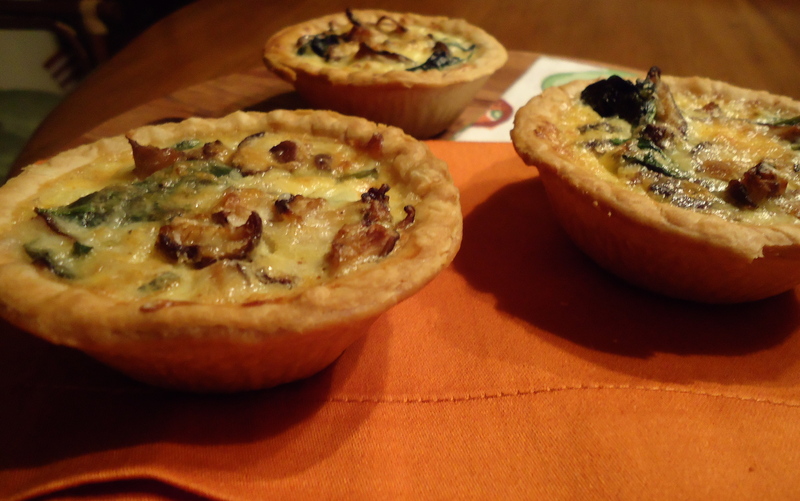 These three mini quiches will make everybody happy. 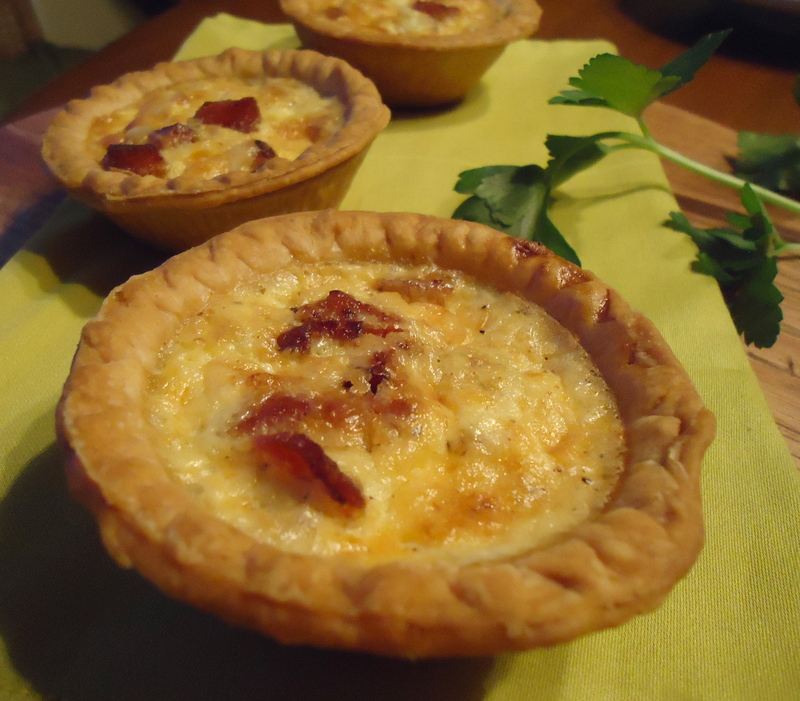 The mini Quiche Lorraine where bacon and grated Swiss come together in perfect harmony! Mini Quiche Florentine soft and tasty and finally my preferred pure creation, The Southwestern Mini Quiche that makes all my entourage waiting for Superbowl Day with expectation. Hot Italian sausages combined with a spicy pepper mix, such a tasty and easy finger food for the Superbowl Party with all your friends! The basic ingredients are all the same, just jazz up your fillings at your likes for a big bash! If you preparing your own pie dough just plan some time ahead. In this case, as I wanted these party snacks done quickly, I used some good quality mini frozen pies. Heat in a medium large frying pan on medium heat. Cook the bacon cubes slowly till well browned and all fat is rendered. Remove from heat, pour fat out in a bowl. Reserve bacon pieces on paper towel. Add over medium heat, a second skillet, sprayed with olive oil, onions to fry gently till slightly browned. Reserve. Divide evenly bacon pieces and onions on the bottom of 5 crusts, pour batter into each one, add grated Swiss cheese enough, mix gently with a fork, so that bacon pieces can swim on surface, adjust with pepper and touch of nutmeg. Place quiches on a baking sheet, and bake for 25 to 30 minutes. When the batter raises, still giggling and crust is browned. mini quiches are done. Cool on wire rack. Chop garlic, mushrooms and parsley. Bake and cool as you did for Quiche Lorraine. In a medium skillet sprayed, over medium heat, brown sausages chair, gently for about 5 minutes, add red wine let it reduce slowly. In a second skillet pour olive oil, saute’ pepper and onions, jalapeno if you like, when all are tender, sprinkle with red pepper power, paprika, add drops of Tabasco. Fill 6 remaining pie crusts with half sausage, half pepper onion mix, add batter, grated mexican cheese, pass the fork to evenly arrange the filling. Bake and cool as Lorraine and Florentine. 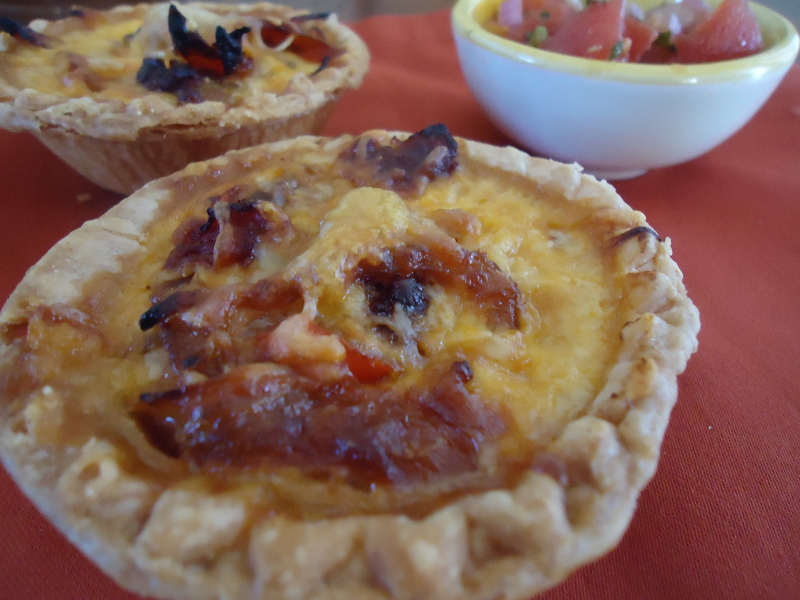 Large and mini quiches are wonderful served warm with a salad or cold , you can keep them in the refrigerator for about 5 days and reheat, covered with a foil, at low heat in the oven.